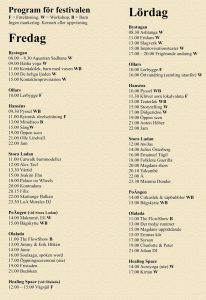 Inspirationsfestival 2018 will take place 13-15 July. Then we will finally enjoy the festival’s 11th edition! In co-operation with , Swedish organization that promotes alcohol- and drug-free cultural activities. 1. Show consideration for accommodation in the village. Do not bet private land, just go on marked paths and public roads. 2. Park only in designated location. Do not park a vehicle along the way any place in the village. 3. Keep your dog connected all the time. The owner takes full responsibility for the dog as well its stools. 4. Alcohol and drugs are not allowed. Smoking is undesirable throughout the festival area but definitely within crowds. Fimpa safe, unavailable for children and animals. Absolutely not on the ground. 5. Use sparingly with paper in the toilets so there is room for more. Tip: §Take with cash! There is no ATM in the village. Our security team will wander around during the festival and make sure that everyone is fine. For questions, send us a private message. And do not forget the most important thing; to have a nice festival!